Lebanon is divided administratively into three levels: provinces or governorates (محافظات), cazas or districts (أقضية), and municipalities (بلديات). There are eight governorates (although a ninth was recently announced), 26 districts, and (as of the 2016 municipal elections) 1029 municipalities in the country. Click on the audio files below to hear the Arabic words for these administrative levels, first in Modern Standard Arabic and then in colloquial Lebanese Arabic. 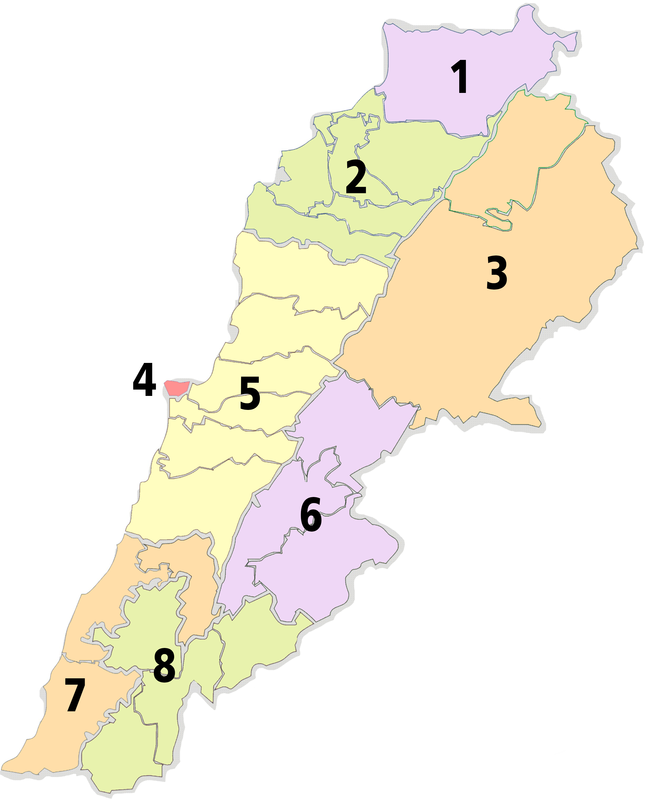 Lebanon has eight governorates, as shown on the following map. Click on the audio files to hear how their names are pronounced in colloquial Lebanese Arabic. 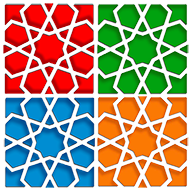 This image and the images below are derivatives of محافظات وأقضية لبنان by Aboluay / Wikimedia Commons / Public Domain. Until 2003, there were only six governorates. Baalbek-Hermel was part of the Beqaa Governorate, and Akkar was part of the North Lebanon Governorate. On August 16, 2017, the Lebanese Parliament announced the creation of a ninth governorate: Keserwan-Jbeil. 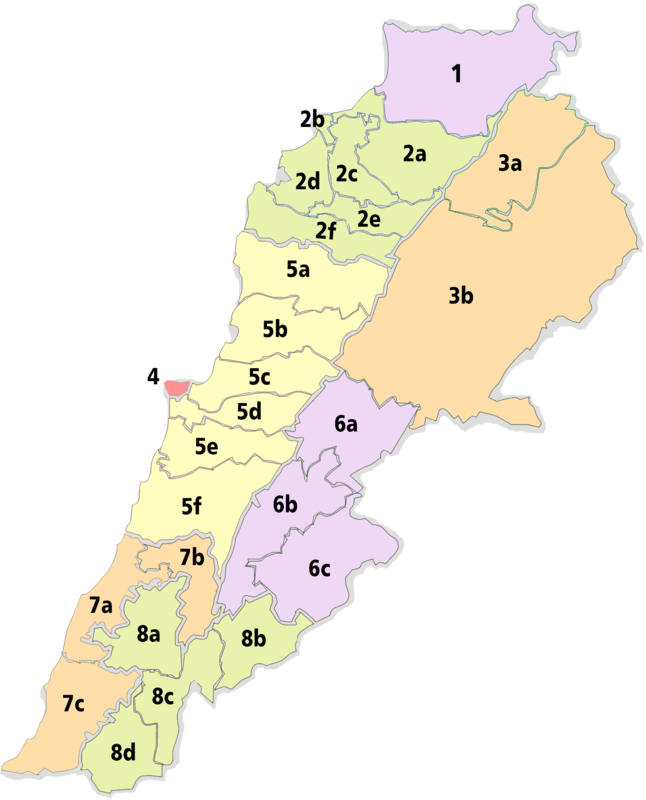 This governorate will contain the two northernmost districts of the Mount Lebanon Governorate, i.e. Keserwan and Jbeil. With the exception of Beirut and Akkar, each governorate is divided into districts. 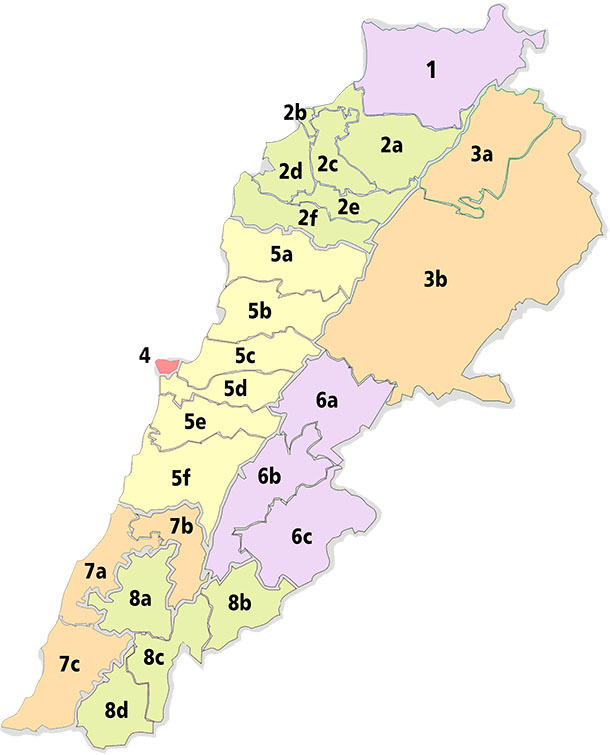 There are 26 districts in total (counting Beirut and Akkar each as one district), as shown on the following map. Click on the audio files to hear how their names are pronounced in colloquial Lebanese Arabic. With the exception of Beirut, each district is divided into municipalities. There were 1029 municipalities at the time of the 2016 municipal elections. Clicking the number of each district on the map below will take you to a Localiban.org page with detailed information about its municipalities. 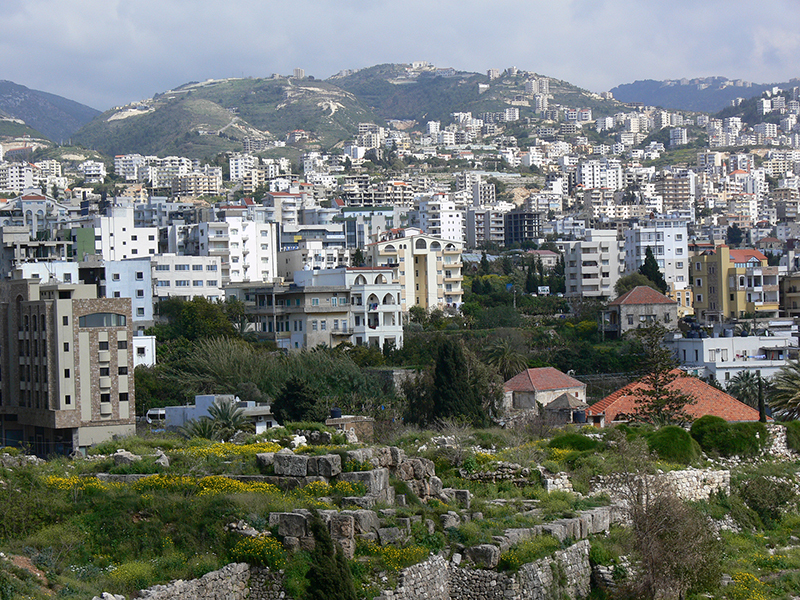 For a complete clickable list of the municipalities, see Localiban’s page on the territorial administration of Lebanon. The following chart lists the capital of each governorate and district in Lebanon. Click on the audio files to hear how these capitals are pronounced in colloquial Lebanese Arabic. The Lebanese Arabic Institute has prepared a detailed interactive map, Local Authorities in Lebanon, which shows the municipal areas of Lebanon and marks the location of cities and villages. It includes links to relevant government and community websites and Facebook pages, Wikipedia and Localiban entries, as well as some videos.